Serving Bowl. 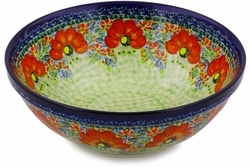 This versatile Polish Pottery Serving Bowl offers a real deal, each bowl a unique hand made work of art. This bowl is a beautiful yet functional piece of Polish pottery, Hand made and hand painted, Polish stoneware is renowned for durability and strength.